The founders of an energy switching service are "delighted" after securing what has been described as the best deal in the history of Dragons' Den. 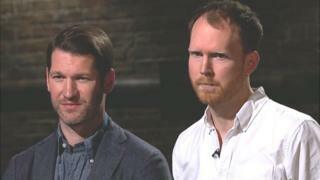 Henry de Zoete and Will Hodson, co-founders of Look After My Bills, received offers from all five Dragons on the BBC show. They ended up selling just 3% of their business for £120,000. The firm aims to find the best gas and electricity deals and switches people automatically when their deal runs out. Look After My Bills also plans to offer broadband deals by the end of the year and other services such as car insurance in the future. After considering the offers they received, the duo accepted investment from two Dragons, Tej Lalvani and Jenny Campbell. Mr Hodson said: "We're absolutely delighted to have got a deal done with two brilliant Dragons, Jenny and Tej, who we know will massively help the business. "This year has seen all Britain's biggest energy suppliers increase their prices, some twice, and the Dragons are backing a company that protects people against rip-off pricing forever." Dragons' Den has been running on BBC television since 2005 and is now in its 16th series. Previously, the smallest amount of equity changing hands on the show was a 5% stake in publishing business Lost My Name in 2005, which was snapped up by former Dragon Piers Linney for £100,000. Lost My Name has since changed its name to Wonderbly and has sold more than 2.7 million of its personalised children's picture books. Mr Hodson and Mr de Zoete met at Bristol University. Mr de Zoete is a former special adviser at the Department for Education, while Mr Hodson started his career at Deloitte before focusing on consumer issues with research cooperative Ethical Consumer. Watch the episode of Dragons Den here.